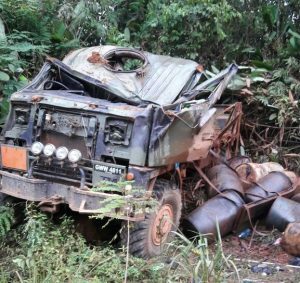 Three men were killed and two others injured were when the fuel-laden truck in which they were travelling turned over twice as it tumbled down a hill in the Puruni River area, police said. Those, who perished are Clifford Anthony Bhim,24, a porter of Itaballi Landing; David Choo-Wee-Nam,52, a miner of Four Miles, Bartica and Jude James,39, a miner of Yarrowkabra, Soesdyke/Linden Highway. Injured are driver Ravi Dookram,29,of 757 Section C ,Block Y Golden Grove, East Bank Demerara and his stepson 18-year old Steve Carr. They were taken to the Bartica Hospital and Dookram was later air-dashed to Georgetown. Police said the incident occurred late Saturday afternoon, October 20, 2018 at Kumung Kumung Trail, Puruni River. Investigators were told that a truck, GWW 4811, transporting about 44 drums of diesels was driving up a hill when it developed mechanical problems and began to descend; in the process , it reportedly turned- turtle twice. At the time,there were two persons inside of the cabin with the driver and two others in the tray.